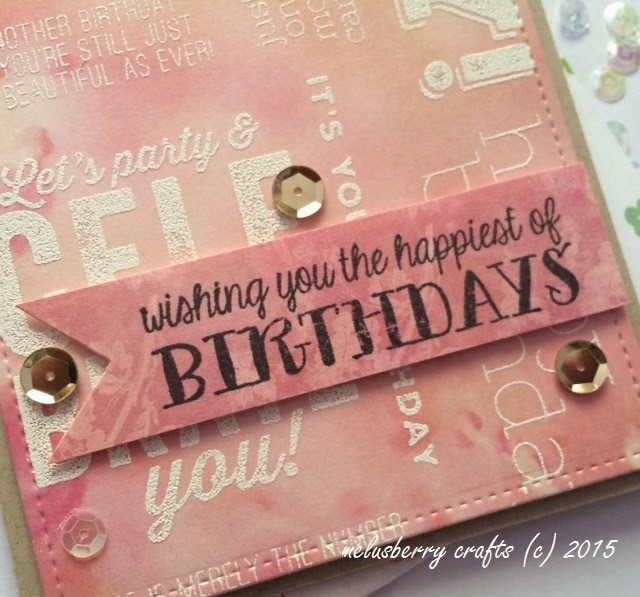 Melusberry Crafts: The Happiest of Birthdays! Last weekend, I went to what I could only describe as a School Disco. There was laser lights - like A LOT of laser lights, a bar with a ridiculous amount of alcohol and a fridge, as well as food and the local DJ. Seriously though it was so much fun and my dancing was on POINT! Anyway, I was asked to whip up a card a day before and created this beauty below, clean and simple, with added sequins! A clean, simple and very girly card for the birthday girl, as well as some added sparkle and glitz with the simple placement of sequins! Hope you guys enjoyed this little card and Happy Crafting!